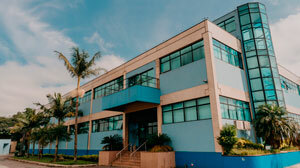 Latinofarma is a Cristália's division dedicated to ophthalmology; its business is focused to technological advancements in this specialty and to develop products that can meet medical needs and improve patients' quality of life. Our Ophthalmology Division has a portfolio of about 30 products in 40 different versions, including anti-glaucoma drugs, anti-infectious agents, combinations, anti-inflammatory drugs, decongestants, diagnostic tests, eye cleaning products, artificial tears, eye lubricants, and reepithelialization agents. Our Anti-glaucoma line includes three eye drops that provide intraocular pressure management, glaucoma and eye hypertension treatment, namely: B-Tablock (levobunolol hydrochloride), Pilocan (pilocarpine hydrochloride) and Presmin (betaxolol hydrochloride). Included in this portfolio are the ointments Maxiflox (ciprofloxacin hydrochloride) and Tobracin (tobramycin), as well as the eye drops Maxiflox (ciprofloxacin hydrochloride), Nostil (ofloxacin), and Tobracin (tobramycin). Two drugs, including eye drops and ointments, are available in our portfolio of Combinations. Designed to treat eye infections, lid inflammation, and conjunctivitis, these products are marketed under the brands Maxiflox-D ointment (ciprofloxacin hydrochloride and dexamethasone) and Maxiflox-D eye drops (ciprofloxacin hydrochloride and dexamethasone). This portfolio includes two eye drops: Flutinol (fluorometholone acetate) and Oftpred (prednisolone acetate), both prescribed to treat allergic and inflammatory conditions of the palpebral and bulbar conjunctiva, as well as corneal inflammatory conditions. 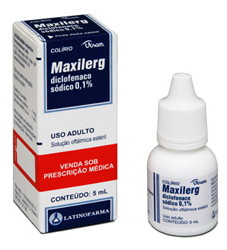 Two eye drops Maxilerg (sodium diclofenac) and Terolac (ketorolac trometamol) make up Latinofarma's Non-Steroidal anti-Inflammatory Agents line. 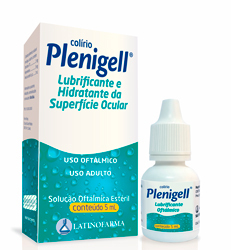 With proven effectiveness in the treatment of chronic conjunctivitis, keratoconjunctivitis, painful post-traumatic conditions of the cornea, pre- and postoperative ophthalmic care, these eye drops are also effective for marginal corneal ulcers. 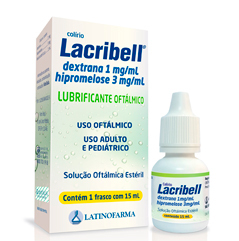 The decongestant Maxibell by Latinofarma is prescribed to treat eye irritations caused by dust, wind, heat, smoke, irritant gases, light, and foreign bodies. Maxibell acts as eye decongestant and astringent. 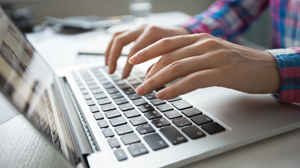 Latinofarma's portfolio of products for diagnosis includes three products. Two eye drops for treating eye inflammation disorders, such as iritis, iridocyclitis, keratitis, and choroiditis, which also help with inducing mydriasis (pupil dilatation) and cycloplegia (muscle palsy) for eye tests and diagnostic procedures, namely: Ciclolato eye drops (cyclopentolate hydrochloride) and Cliclomidrin eye drops (tropicamide). Included in this portfolio is also the Oxinest eye drops (benoxinate hydrochloride), designed to provide ocular globe anesthesia in small surgeries, foreign body removal from cornea and conjunctiva, and diagnostic procedures. 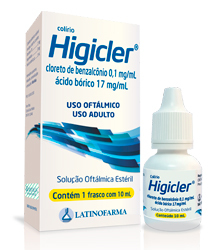 Higicler is a product designed to provide antisepsis and cleaning in eyes irritated by dust, wind, and foreign bodies, as well as for cleaning eyes after swimming in seas or pools. Latinofarma's portfolio of Artificial Tears includes two drugs designed to treat irritation, burning sensation, and dryness of the eyes that can be caused by wind, sunlight, heat, and dry weather. Artificial tears can support lubrication in contact lenses users, providing relief to itchiness, irritation, and discomfort. 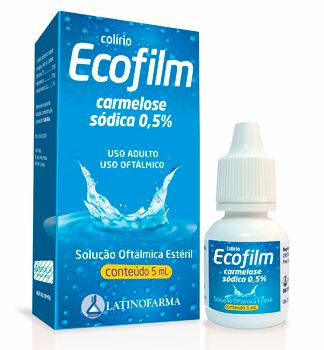 The eye drops Ecofilm (sodium carmellose) and Lacribell (dextran and hypromellose) are included in this portfolio. 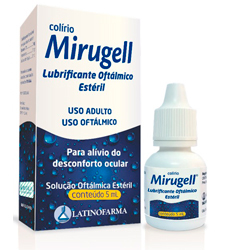 This portfolio is composed by two products: the eye drops Mirugell (polyethylene glycol, propylene glycol, and hydroxypropyl guar) and Plenigell (sodium carmellose and glycerol), both indicated for temporary relief of ocular irritation, redness, mild pain and burning sensation. Regencel ointment (retinyl acetate, amino acids, methionine, and chloramphenicol) is indicated to provide and protect epitelization (skin renewal) and regeneration of injured ocular tissues.